Check below.. I found my flower! 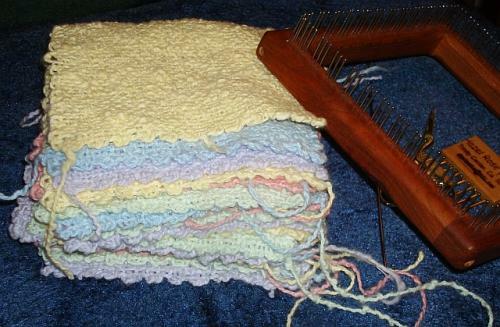 I think I have nearly enough blocks to start assembling this blanket. I’d like it to be Crib sized or nearly so but need to research how big that is. I have ordered the white yarn for assembling but it has not arrived yet, should be here any time. It’s coming from KnitPicks, their Crayon, which should match this discontinued Paton’s Cotton Top. I hope. But I am also getting things straightened around so our grandson has a place to stay. He’s arriving next week to spend some of the summer helping Randy build our new shop. But as there has been a snag in those plans it looks like he’ll get to help build the new deck first & anything else that needs doing. Hope your summer is both warm and going smoothly!